~Do you go out shopping on Black Friday? While Black Friday is the official start of the holiday shopping season, for me, it is the official start of the holiday sewing season! I usually stay home and start my gift giving sewing. I love to sew pajama pants and robes for holiday presents. They are easy to fit, easy to sew, and easy to personalize. You can make it in someone's favorite color, or if they have a special interest, choose a fabric that reflects that. If you're in a cold climate, you can use fleece or flannel, and if you're in a warm climate, you can use lightweight knits or cottons. 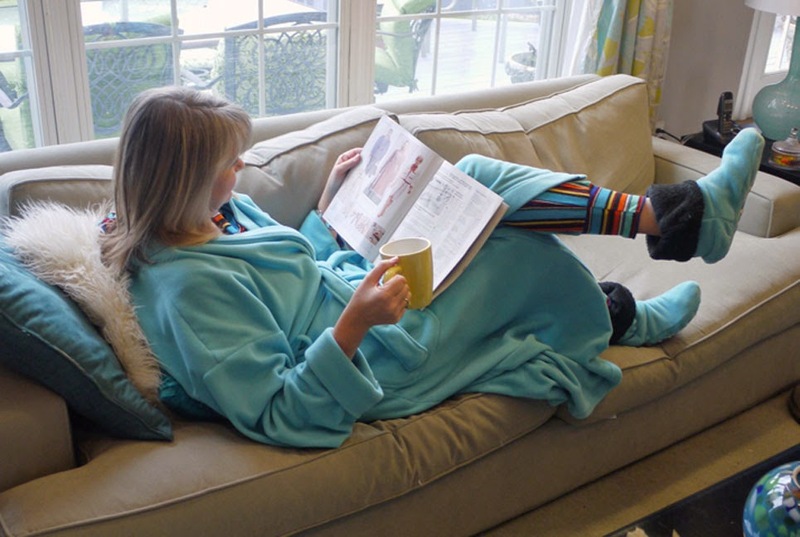 Men, women, boys, girls- you can really make everyone happy with a new robe and pajamas! Although I make them for my family, I had not made myself a robe and pajamas for years, so, I decided to treat myself to a new set. 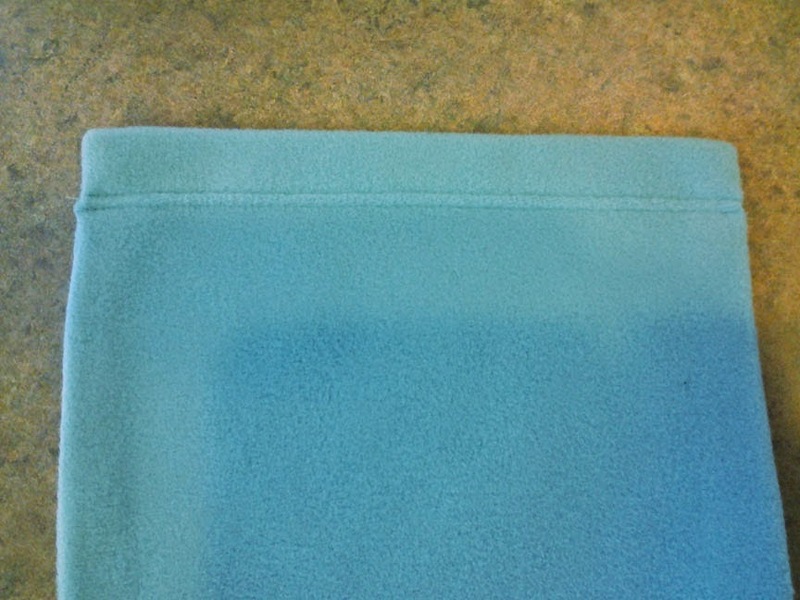 I live in Illinois where we can get bitterly cold winters, so I chose Fabric Mart's sky blue polar fleece for my robe. It seemed like such a cheery color that it would brighten up grey winter mornings. This is a higher quality fleece than the fleeces you can find in the chain stores. It is light, stretchy and velvety soft. For the robe, I used McCall's 5769, but added 13 inches to the length. 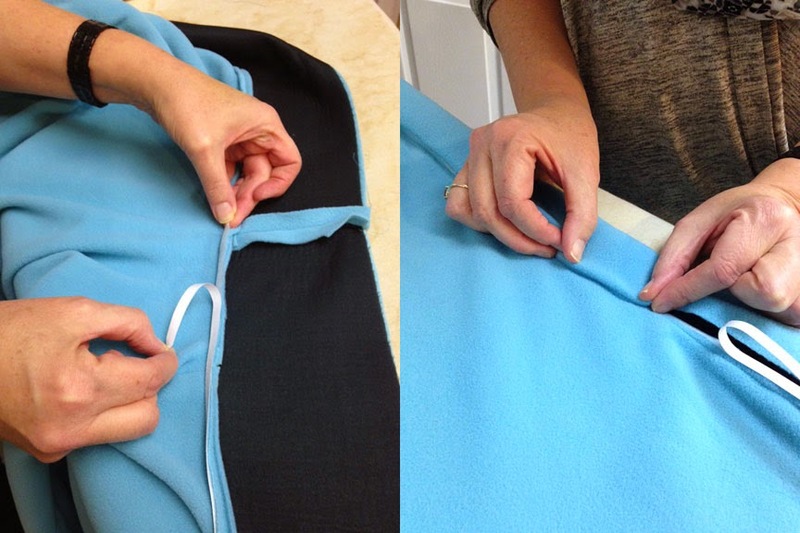 Robes are a really great project for beginners, but there are some tricks that will help you get a nice result. My trick for making both the pockets and the placket is to interface them with a lightweight knit interfacing, then use wonder tape to adhere the stitching area. If you've not used Wonder Tape before, you must try this stuff! I use it all of the time in sewing. It's a double sided tape that will wash away the first time you wash your garment. It take the place of pins, and it is ideal for sewing on pockets, zippers, or anything that you don't want to shift at all when you are sewing. 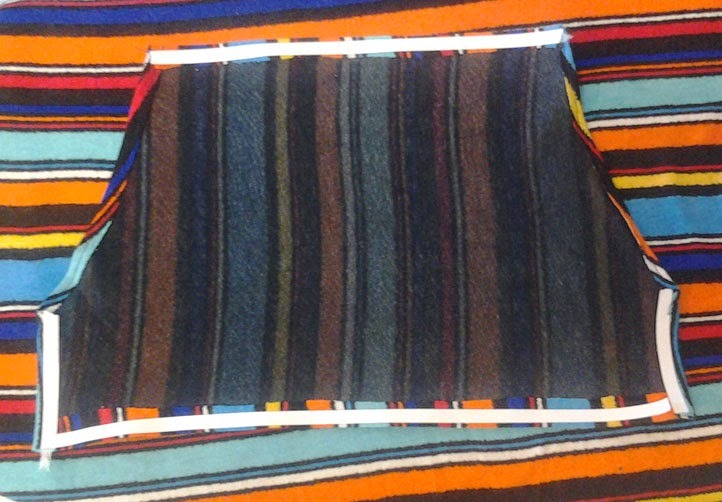 I used a double needle to topstitch the pocket to the robe, and to stitch the front band down. 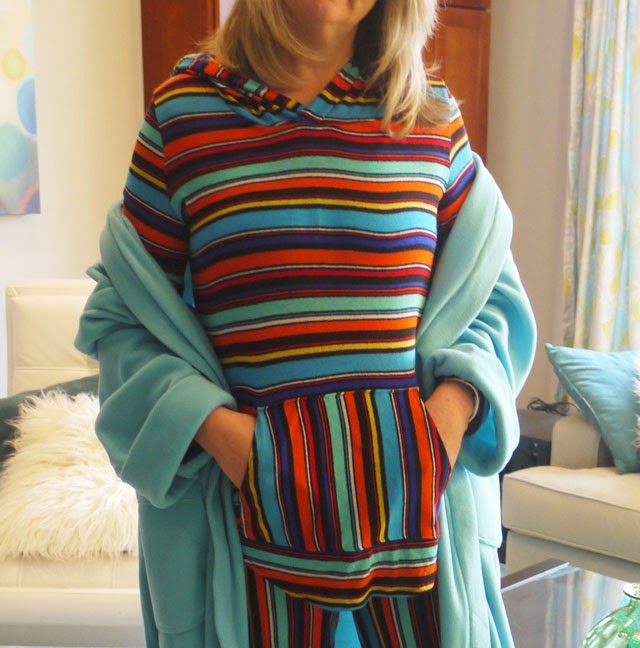 For the pajamas, I used a rayon lycra knit called Marker Stripe. I loved the saturated colors in the stripes. It's very loosely knitted, and stretches like crazy. It shrunk about 20% after I washed it, so I didn't have quite enough yardage to make what I had planned. But, luckily, it had 4 way stretch, so I was able to rotate some of the pieces to fit on what I had. I used McCalls 7061 for the pattern. This is a really cute pattern with several variations on the standard hoodie plus shorts, pants, and booties. Because my fabric was so super stretchy, there were a couple of things that I did to stabilize it to make it easier to sew. First, I interfaced the kangaroo pocket with a piece of lightweight knit interfacing. This helps to keep knit pockets from bagging out, and it also helps to keep the edges from waving. After I interfaced it, I turned under all of the edges, and then used Wonder Tape to attach the edges to the shirt front. The second trick was sewing in a twill tape in the neckline seam that connects the shirt to the hood. This area was going to stretch out of shape unless I added in something to stabilize it. Twill tape is a soft, inexpensive way to stabilize. 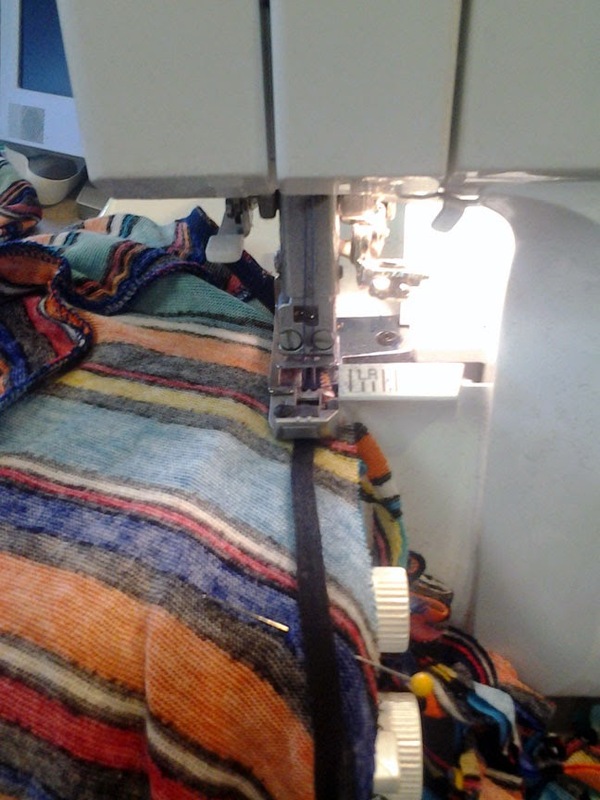 Just feed it into the serger as you are sewing the seam. The bootie pattern was a little vague on the sizing, and I cut the Large because I wear a size 9 shoe. It ended up being HUGE, and I ended up cutting it down a couple of sizes to fit better. 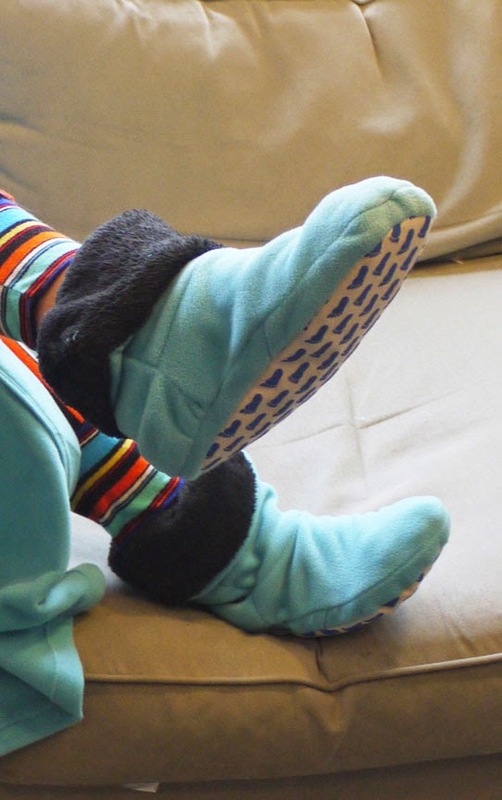 I used my old fleece robe for the black lining in the booties. They are still big, but I think I'll be doing more lounging than walking in them, so they'll work fine for that. I used a cute gripper fabric with feet for the bottoms. I’m SEW happy to have my new pajamas, robe and booties! What presents do you like to sew for your holiday gift giving? Love the robe! I just finished making a hooded fleece robe for my dad with Simplicity 3575. Great idea on the matching booties. I may try some slipper socks. Love this! I'm making a robe for my son, and it has been a battle fighting the crawling fabric. I finally ended up hand basting many parts together in order to keep the pieces from crawling apart.